Good day, we have discovered on new builds using DJI A3, LB2, M600 camera plate adapter and X3 cameras that GS Pro does not take photos during mapping missions. The camera works fine otherwise (using Go app) but in GS Pro it does not. DJI? is it a known issue and you are working on it? We have drones out there with all the same hardware and firmware so I am not sure where the fall down it. One thing I noticed on the M600 camera adpater plate is that they have changed the board inside. The plug now plugs in 180 degrees from the old ones... and this makes me wonder what else they changed??? anybody? DJI? we have four units now that do not work. So other apps work if you trigger taking photos and recording on the app but GS Pro does not, right? Could you please help to name the version info about the drone and app? A comparison video makes a great help if it can be provided. Thanks a lot. I have solved this issue. If you assign a camera trigger in the channel assignment then it no longer triggers the X3 camera automatically in a mission. So the camera trigger output is totally useless. If you want your x cam to trigger automatially you must not have the trigger assigned to an output. If you want your external camera to trigger you can select the output port to do so but not only will it NOT actually put out a PWM to trigger it will lock out your X cam. This is a bug that needs to be adressed. I had the same issue with M600 pro and an x5 camera. it would take photos manually when flying a mission. Also I could not flip the camera up for landing. Hi Niwa, just to clarify, the gimbal was assembled on the drone successfully with the gimbal mounting bracket, and you can take photos by the RC manually, right? Please also help to confirm if you had mapped shutter to any F channel, please do not map the shutter to the F channel. See if this works. For the camera&apos;s issue, may I know if you can control the gimbal when landing? Thank you for your response. My service agent is now dealing with this. We need to trigger an external camera as well. Probably fit the ronin start/stop. Thanks for getting back, hope your case will be sorted out soon. A warm prompt, if you need to mount a third-party camera and have the GS Pro triggered the shutter automatically, you need to have the M600 Pro + Ronin-MX + the supported camera + GS Pro. 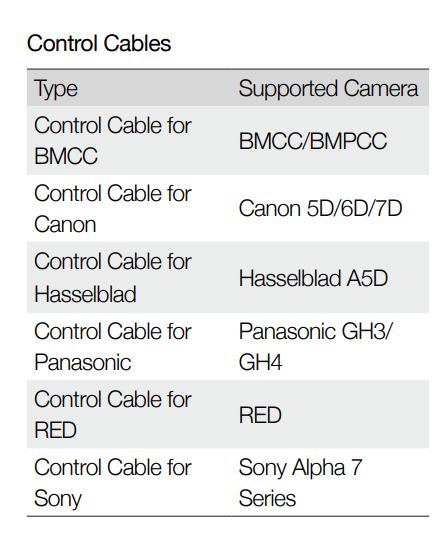 Theoretically, the camera that supports the RSS of the Ronin-MX is supported, you can refer to the supported camera below. Hope that helps to provide you with some info. I have this issue using A3 latest FW + S900 + Lightbridge 2 + Zen X5 (I have posted on this issue). I have slaved a Micasense RedEdge to the A3&apos;s F3 port. When using GO app and the remotes shutter button both camera fire and record images on the SD Cards. However when running a mapping mission using GS Pro the slave RedEge is triggered and records images but the X5 only rotates to nadir view and records nothing?